Rep. David Guttenberg, D-Fairbanks, makes his announcement that he won't be running for re-election to the monthly meeting at the Fairbanks Laborers' hall on May 9, 2018. Long-time Fairbanks Rep. David Guttenberg announced Wednesday night that he will not run for re-election. 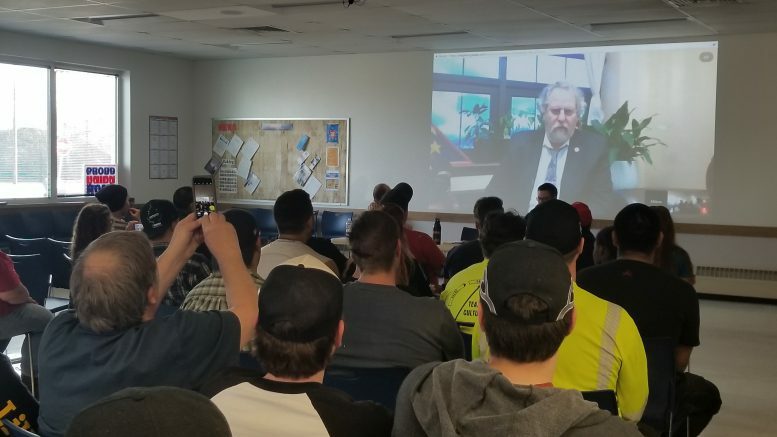 Guttenberg, 66, made the announcement in a call-in to the monthly meeting at Laborers’ Local 942 hall in Fairbanks, where the Democrat launched his political career. “Someone shoved a finger in my chest and said if I was complaining about the out-of-state hire I should do something about it,” Guttenberg said in an interview with The Midnight Sun prior to the announcement. From that moment, Guttenberg became involved with the local Democrats before rising to party leadership, a job as a legislative aide and eventually a run for office. He’s served in the Legislature for 16 years. He said he had hoped to make the announcement in-person, but the long session prevented that. “I’m returning to where I started and will not be running for re-election,” he announced. Guttenberg said there are quality people who are interested in pursuing the seat, but said he doesn’t plan to endorse anyone in the Democratic primary. Guttenberg was shortly hospitalized during this session, but says that his health is not a contributing factor to his decision to leave office nor is there any pending controversy, he added. “I guess you have to say that nowadays,” he said. Laborers’ Local 942 Business Manager Scott Eickholt thanked Guttenberg for his service. Guttenberg’s House District 4 covers the Goldstream Valley, Ester and Farmers Loop areas of Fairbanks. The district is generally considered to be the most liberal district in the Interior even though registered Republicans outnumber Democrats by more than a thousand voters. Guttenberg joins four other Democratic legislators who’ve officially announced their plans to leave the Legislature after this term. Anchorage Democratic Sen. Berta Gardner, who’s the Senate’s minority leader, doesn’t plan to run for re-election, and all three of Juneau’s legislators–Sen. Dennis Egan and Reps. Justin Parish and Sam Kito–have announced they will not run for re-election either. There is currently no other Democratic candidate to have filed for the seat, but Republican Jim Sackett filed earlier this year. Be the first to comment on "Fairbanks Rep. David Guttenberg announces he won’t seek re-election"